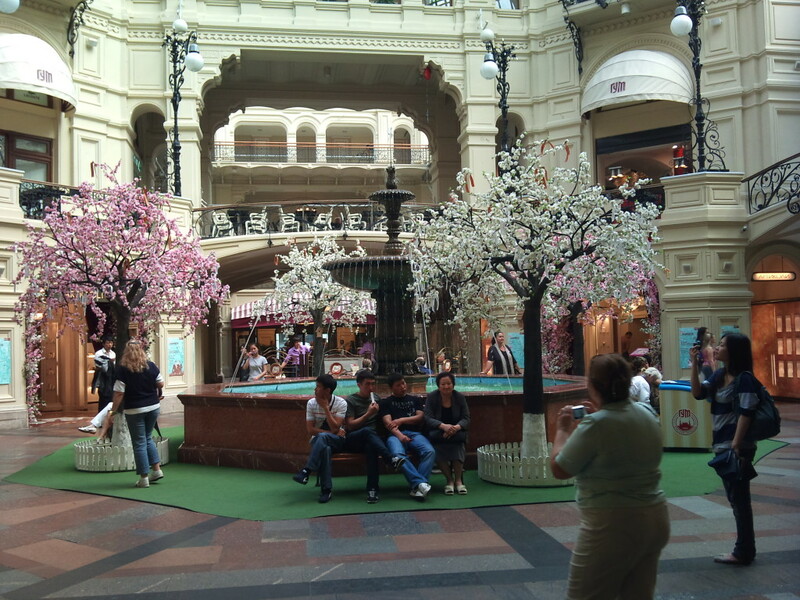 There are quite a few difficulties facing anyone who comes to Moscow as a tourist. The major one is, to my experience, the language. Not only is it impossible to understand what they are saying, it is also impossible to read any sign. Because Russians use the Cyrillic alphabet, it is virtually impossible for westerners to understand. It is therefore a necessity to find a guide to help you. We were lucky enough to find what must surely be the best of them all; Elena. 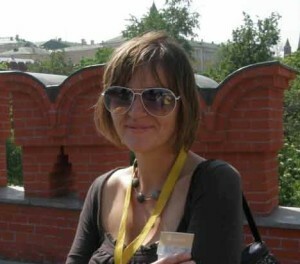 Elena is highly knowledgeable as well as a very pleasant person to be with. We cannot recommed her enough. We met up with Elena just outside the big, brutal apartmentbuilding where we lived. She had in advance mailed us some suggestions on where to go and what to see and had told us to wear good walkingshoes. Unfortunately she had forgotten that herself, but still, with all the blisters she eventually got on her feet, it didn’t seem to bother her at all. She took us to all the landmarks and important places; The Red Square, to the Bolsjoi, to the inside of the Kremlin, to the famous metro-stations and all the main sights. The Red Square (Krásnaja Plóščaď) is the central city square in Moscow. (The russian word for red, Krásnaja, also means beautiful, so the name has actually nothing to do with the communist era or the red brick walls surrounding it) The square separates the Kremlin,which used to be the royal castel and today is the official residence of the President of Russia, from a historic merchant quarter known as Kitai-gorod. 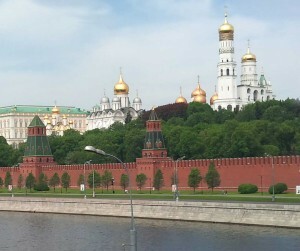 The Red Square is often considered the central square of Moscow and all of Russia, because all of Moscow’s major streets, which connect to Russia’s major highways, originate from the square. The Cathedral of the Protection of Most Holy Theotokos on the Moat is the official name. The church is also called the Cathedral of St. Vasily the Blessed or in English: Saint Basil’s Cathedral. It was built from 1555–61 by Ivan the Terrible to commemorate the capture of Kazan andAstrakhan. It is the geometric center of Moscow. During the Communist-era the church was confiscated as part of the program of state atheism, and has been operated as a division of the State Historical Museum since 1928. It was completely and forcefully secularized in 1929 and, as of 2012, remains a federal property of the Russian Federation. 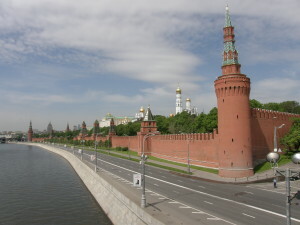 The church has been part of the Moscow Kremlin and Red Square UNESCO World Heritage Site since 1990 and it is often mistakenly called the Kremlin owing to its location on Red Square in the immediate proximity of the real Kremlin. GUM (short for; Glavnyi Universalnyi Magazin meaning “the Main Universal Store”), is the large department store facing the Red Square. In Soviet times it was known as the State Department. There used to be a number of GUMs in many parts of the Soviet Union, but this is the most famous one. 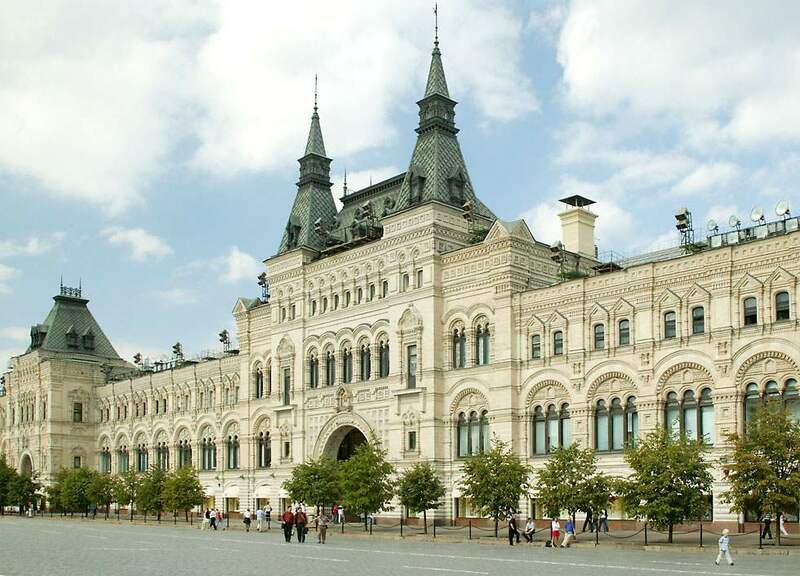 The original was built in the reign of Catherine the Great but was rebuilt again after the great Moscow-fire in 1812. By the time of the Russian Revolution in 1917, the Store contained more than 1200 shops. It was nationalized by the Communists and efforts was made to make it the symbol of “communism through consumerism, but succeeded only in alienating the consumers and laying the grounds for and instituting a culture of complaint and the rights of the few. For a short period in 1932, Josef Stalin used it as a mausoleum for his wife Nadezhda Alliluyeva, who shot herself after a dinnerparty in the Kremlin. The GUM was reopened as a department store during 1953 and became one of the few stores in the Soviet Union that did not have shortages of consumergoods. 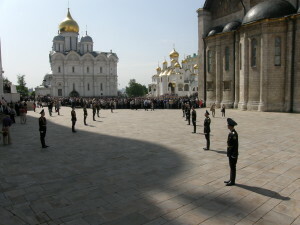 The queues of shoppers were sometimes long, often extending all across the Red Square. At the end of the Soviet era, GUM was partially, then fully privatized, and it had a number of owners before it ended up being owned by the supermarket company Perekryostok. Today the GUM contains more than 200 stores and is definitely worth a visit even if it’s just to look.